The call of roots is something very hard to define. Indeed, just what is it that makes a person come back to his or her roots, even after having gone far away to a distant land, to embrace new people and newer cultures, to a place where there is no trace of her ancestry. While we often tend to forget about our origins in the humdrum of day-to-day existence and in our quest to move ahead in life, the fact remains that a person is incomplete without his roots. Such is its power that it can make one go out of the way to preserve his or her heritage, even in foreign and unknown shores, against the set and conventional patterns of life of the land where he or she now resides. As of today, Sanghamitra has made a mark as a top-notch journalist with one of America’s largest newspapers. She is presently an editor at the Wall Street Journal and thanks to her penchant for research and incisive analysis, she is today regarded as an authority on global economic trends. Her book on the Indian economy will be released by Harper Collins by the end of this year. Sanghamitra had the nose for news all right. But even after living in the States which can be much more liberal for children in comparison with India, she still had few role models in the media. Her predicament can be understood from the fact that journalism is not a field that Indo American families normally encourage their children to pursue. She recalls, “When asked to name some other Indian Americans practicing journalism in the States, I remember not being able to give a concrete answer. There were plenty of doctors or computer engineers then.” She, however, followed her dreams and went on to procure a degree from the prestigious Columbia School of Journalism. Sanghamitra Kalita began her career in journalism in the New Jersey bureau of the Associated Press, a premier American news agency. But it was only when she joined Newsday, a major newspaper in the New York area, that she got noticed for writing a series of articles on the burgeoning Indian economy and how the country was about to burst into the world stage. She also wrote about small business, Enron and the terror attacks of 9/11. That was the beginning and since then, she has been bestowed with a number of awards and commendations and has also been featured in the Best Business Stories of 2003. Besides economics, Sanghamitra is also a keen follower of immigration issues. 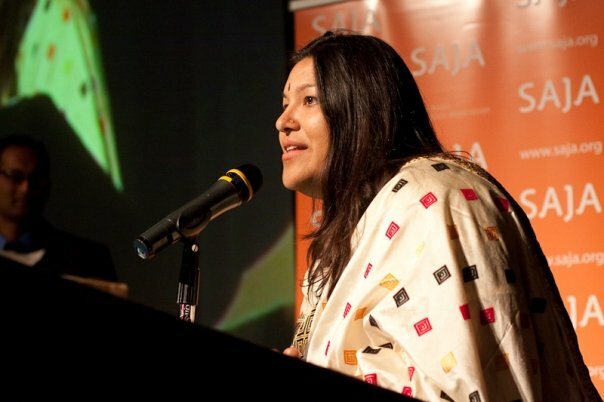 Having lived in a variety of places in the US over the years, particularly in Puerto Rico, and having gained a wider perspective of immigration issues, she has extensively covered the South Asian diaspora in her news reports. For instance, in the aftermath of the September 11, 2011 terrorist attack at the World Trade Centre, she had reported extensively on the immediate backlash against Arabs and South Asians living in the New York city area, and had also written a chapter for ‘At Ground Zero: Young Reporters Who Were To Tell Their Stories’. For someone who has got a taste of Indian journalism as well, Sanghamitra feels that the context in Indian journalism is largely missing and appears to be more “agenda-driven,” which is understandable, she says, given the larger number of newspapers – ideologically, linguistically and regionally – in India. “Over here, the lines seem to be much more blurred – politics, business, journalism,” she said, even as she harped on how ethics comprised a fundamental aspect of journalism. “Public trust and clarity is most important,” she added as she deliberated on the fixation of journalists in both countries for the “breaking news” phenomenon. Despite her manifold achievements and even after following such a hectic lifestyle, Sanghamitra still treasures her Assamese roots. If you are wondering, just in case, she speaks extremely fluent Assamese and danced Bihu as a child, having learnt it in her grandmother’s drawing room in Santipur. Living in an environment dominated by English, I felt this is indeed commendable. “We speak Assamese at home and so does my daughter now – although we really have to remind her. My parents realized that language was very important for me to have a connection with my relatives back home in India,” she says. As Sanghamitra has worked with immigration issues for a long period of time and since she is also a part of the Indian diaspora in the US, our conversation not surprisingly veered to the issue of racial discrimination, which has started occupying news headlines once again after the recent attacks against Indians in Australia. “The Assamese community in the States is very small and when we talk about representation, it is more on the lines of an entire country, say Indians, Pakistanis and Bangladeshis. Racial discrimination certainly exists in the US but I can’t say it pervades my daily life. To be honest, Indians benefitted greatly from the Civil Rights movement but the groups that made Indians’ success possible – such as Blacks and Latinos – still lag behind Asians in income levels. Besides journalism, Sanghamitra Kalita is also a prolific writer, having authored a highly acclaimed non-fiction book, Suburban Sahibs. The book is an account of three immigration families and how they go about following their dreams in a foreign country. Each family represent an entirely different stratum of society, but together they build up the fabric of the greater American society. At a time when Indians have become a major community in the US and have become a defining factor in US politics, Sanghamitra has managed to draw in her book a vivid account of this particular community, touching on how their immigration has changed the American suburbs and how America, in turn, has transformed them. Suburban Sahibs has won the ‘Winner of the Celebration of Immigrant Voices Award’ from the International Institute of New Jersey and the ‘2004 New Jersey Authors Award’ from the New Jersey Studies Academic Alliance and New Jersey Library Association. The soft-spoken writer is presently working on her next book which is due to be released later this year. Sanghamitra is married to Nitin Mukul – a designer and artist who also loves to DJ in his free time. Nitin works as a Visual Art Director for various projects, having conceived the promotional material of quite a few films. Two noteworthy films of recent times of which he was a part are 3 Idiots and Supermen of Malegaon. Together, Sanghamitra and Nitin have a five-year old daughter, whom they have named Naya Meenakshi. She now dances Bihu.